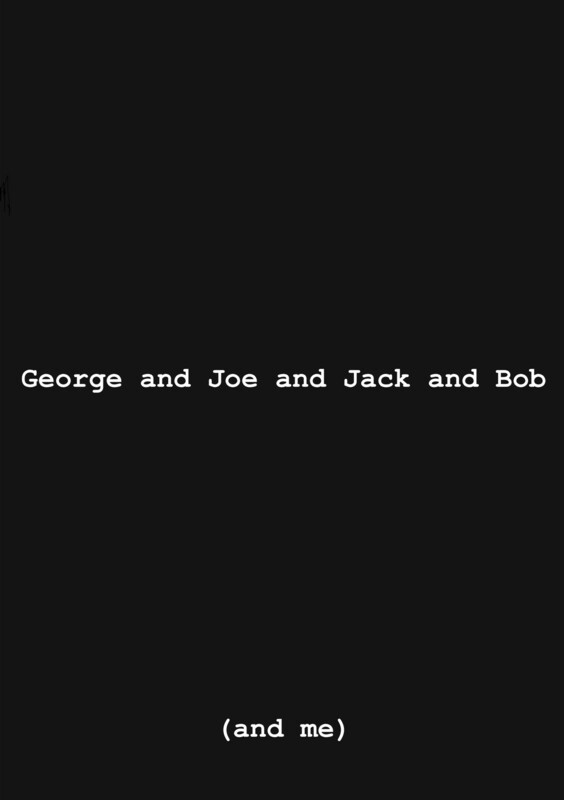 On Page 212 of Hero With a Thousand Faces comes The Diagram which me and George found so exciting. The Hero sets out; he crosses the threshold of adventure; he experiences some kind of crisis; he returns home with some kind of reward. It isn't too hard to spot this pattern in the lives of Luke Skywalker, Barack Obama, King Arthur and other people of that kind. Campbell claims that the structure is "universal": by which, I think, he means no more than "examples of stories with this structure can be found all over the world". 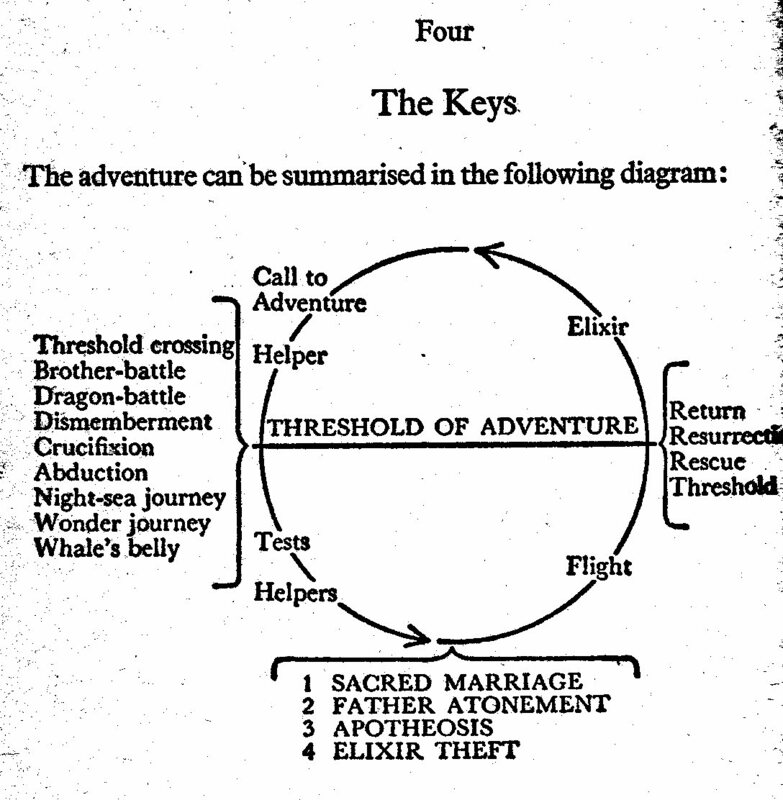 His followers, however, have made a much grander claim: they say that all stories follow this structure; that this diagram represents the only story that there can possibly be. In his study of world hero myths Campbell discovered that they are all basically the same story – retold endlessly in infinite variations. He found that all story-telling, consciously or not, follows the ancient patterns of myth, and that all stories, from the crudest jokes [*] to the highest flights of literature, can be understood in terms of the hero myth; the "monomyth" whose principles he lays out in the book. Well. If we define "hero myth" as "story which conforms to the pattern proposed by Campbell" then it is trivially true that all hero myths conform to Campbell's pattern. (If you reserve the word "science fiction" for stories which are based on accurate science, then it is a no-brainer that all science fiction is scientifically accurate.) But Vogler goes much further. Not only do all hero-myths conform to one structure, but all stories are hero myths. In the hands of his more wooly-minded followers, Campbell's theory undergoes a further metamorphosis. "Stories with this structure occur in all cultures" becomes "All stories have this structure" which in turn becomes "All stories ought to have this structure". Campbell's observation becomes an imperative. Question: Is "All hero myths have the same structure" synonymous with "All hero myths are basically the same story"? The diagram in Hero With a Thousand Faces is a circle containing only 4 points. 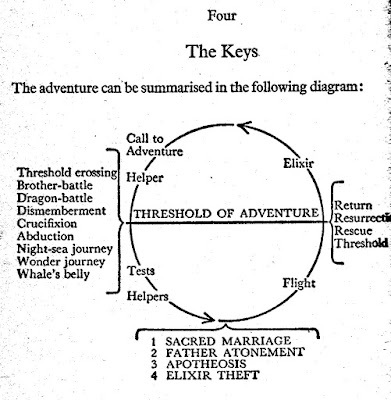 Point 1 is where the Hero sets out from and return to: the other three points contain a total of 17 things which might happen to him along the way. They represent different versions of the Hero's journey. When the hero sets out he might fight a dragon, or his brother, or some other opponent who guards the doorway between the normal world and the world where the adventure happens. He might defeat it or he might charm it. On the other hand, he might literally die or be swallowed by a whale, in which case the adventure might happen in the afterlife. In some stories, the hero is given the opportunity to go on a quest, but refuses it, in which case (of course) the story ends there. At the "nadir of the mythological round" the hero might marry a special bride; on the other hand, he might be acknowledged by his father, or by a father figure; someone might give him a magic "elixir" or he might steal it. On the way back he might be chased by hostile forces (if he stole the treasure) or be accompanied by friendly ones (if he was given it as a gift). Vogler's version, on the other hand, has 12 points: the ordinary world, the call to adventure, the refusal of the call, the meeting with mentor... a fixed sequence rather than a series of possibilities. Vogler admits that he has changed Campbell's pattern (in order to make it more relevant to the contemporary world in general and movie making in particular – which rather undermines it's claim to being universal). He also says that when using it to create your comic book or dirty joke, you shouldn't stick to it too closely. But it is very striking how proscriptive Vogler is compared with Campbell. stories built on the model of the hero myth have an appeal that can be felt by everyone, because they spring from a universal source in the collective unconscious, and because they reflect universal concerns. Never mind spending 40 days in the wilderness or meditating 'neath a tumtum tree. Don't even bother studying the Talmud or going on a weekend retreat with the Alpha Course. Merely reading Hero With a Thousand Faces is enough to change your life. It's a little like one of those Calvinists trying really, really hard to save your soul you because it has already been predestined that your soul is going to be saved; or a Marxist struggling towards the Revolution because the Revolution is historically inevitable. You've got to try really, really, really hard to make your story fit Campbell's narrative structure, because all stories, from high flown myths to dirty jokes, fit in with that structure, whether the storyteller means them to or not. The Ordinary World: "A man walks into a bar." The Call to Adventure "He notices that the man who is tinkling away on the piano is only about a foot tall." Refusal of the Call: "He asks the barman why piano player is so short. The barman says he will tell him in a moment..."
Meeting the Mentor: "....But first, says the barman, he must rub a Magic Bottle which is kept behind the bar for first time guests." Crossing the Threshold: "The man rubs the bottle as he was told"
Tests, Allies and Enemies: "And, lo and behold, a magic geni appears." The Approach: " 'Since you have never been to this bar before, I shall grant you one wish!' says the geni." Ordeal, Death and Rebirth: "The man thinks very hard, and says 'I'd like a million bucks.' "
Reward: "The geni says some magic words, and lo and behold, a million ducks fly into the bar, and starting quacking furiously." The Road Back: "The man is disappointed." Resurrection: " 'No, not ducks!' he says 'I wanted a million bucks -- a million dollars.'" Return with the elixir: " 'Yeah' says the barman sadly. 'And do you think I wanted a twelve inch pianist?' "